Lesson Focus: Ancient Rome and its transition from Republic to Empire. Prior knowledge: See prior Lesson Plan on Ancient Rome and other Roman Republic Lesson Plans. Materials Needed: Textbook, notes below, library or internet research. NCSS Thematic Standard: II, Time, Continuity, and Change. NCSS Thematic Standard: X, Civics, Ideals and Practices. NSS-WH.5-12.3 ERA 3: Classical Traditions, Major Religions, and Giant Empires, 1000 BCE-300 CE; Standard , How major religions and large-scale empires arose in the Mediterranean basin, China, and India, 500 BCE-300 CE. Following a discussion on the facts and events below, and a review of the prior lesson on Ancient Rome, the class can create a graphic timeline. Assign students topics from the notes below. (Some suggested topics are in bold) Students should draw or find an appropriate picture to accompany their assigned topic and, after explaining their entry to the class, place it on the timeline. The timeline should be a decoration for the classroom. Consider using yarn to hang each entry (sturdy paper, a hole punch and tacks should help you string the timeline around the room), or just tape students’ creations in order on a bulletin board. The Roman Republic lasted for 500 years. Expansion was fueled by a dedicated army of legionaries. Conquered territories were often treated well and allowed to maintain their own government or were made citizens. However, many were enslaved and by 100 BC, slaves comprised 30% of the population. Slaves worked the latifundia, or large estates producing olives, grain, fruit and sheep for the cities. Displaced laborers crowded Roman cities and the gap between the wealthy and poor grew. These stresses along with the Punic Wars, expansion in the Mediterranean, and slave revolts weakened the Republic and strained its resources. Rome’s citizen army was manned by small framers, an ever decreasing segment of the population due to the latifundia. Generals began to pay the cities’ unemployed laborers, and professional armies with loyalty to their generals grew. Generals used their armies to gain political power. Julius Caesar was born to an aristocratic family in Rome in about 100 BC. In 60 BC, he, the General Pompey and a politician Crassus formed a powerful alliance. 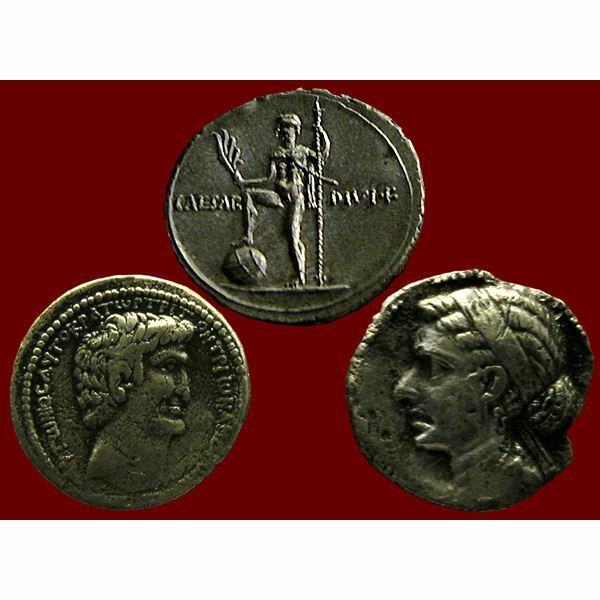 In 59 BC, Caesar was elected consul and for ten years the three men ruled as triumvirate. Caesar’s defeat of the Celts in Gaul and other military victories gained him popularity with the Roman people, especially the plebeians. His fame threatened the Senate. With Crassus killed in battle, Pompey backed the Senate in ordering Julius Caesar to give up his army and come back to Rome in 49 BC. Instead, Caesar assembled 5,000 faithful troops and crossed the Rubicon, (a river dividing his military provinces from Roman Italy). He captured Italy and eventually defeated Pompey at Pharsalus, Greece in 48 BC. Instituted public works programs to give jobs to the poor, and forced landowners to hire laborers. Added Senators from provinces loyal to him increasing his own power at the expense of the patricians. On March 15, 44 BC, Brutus and Cassius led a group of Senators in the assassination of Julius Caesar. They justified it using an ancient Roman law stating anyone who contrived to be king could be murdered without a trial. 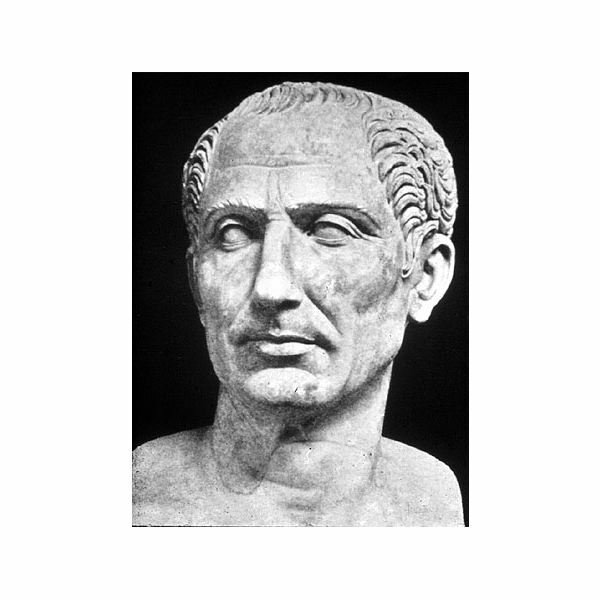 Julius Casear was followed by his nephew Octavian who formed a second triumvirate with Marc Antony and Marcus Lepidus, top official from Caesar’s government. The second triumvirate divided the empire. Antony married Cleopatra and Octavian declared war on Antony in Rome’s name. He overpowered their navy at Actium in 31 BC and a year later Marc Antony and Cleopatra committed suicide to avoid capture. Octavian convinced the Senate that the Republic’s laws had been ineffective in managing expansion and a growing population. Meanwhile, military leaders had taken control. Rome, he claimed, needed on forceful leader. In 27 BC, the Senate made Octavian consul tribune, and commander-in-chief for life. Octavian called himself Augustus, the Majestic One, and while he claimed to support the Republic, actually became an absolute ruler and began the Roman Empire. Augustus was the first Roman Emperor. Latifundia-large estates owned by wealthy landowners and worked by slave labor. Triumvirate-three people with equal power. Empire-number of territories or countries governed by one ruler or government. Reserach Marius-the first military leader of Rome. He became consul in 107 BC. Research Sulla-a general who fought with Marius for control of Rome. What does the term “crossing the Rubicon" imply? Explore Ancient Rome in Google Earth. A series of lesson plans for a world history curriculum. This series is a continuation of two other collections of world history lesson plans.